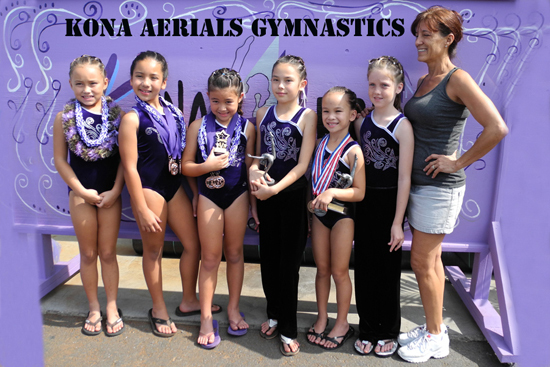 Kona Aerials Gymnastics Team hosted the 2011 Hawaii State Compulsory Championship on Nov. 19-20. Competing with more than 190 athletes, the Kona girls did well bringing home medals and trophies. In Level 5, Ileana Hinchcliff captured a third place all around trophy with a first place on floor with 9.25, a second on bars with 9.025 and third on vault with 8.625 and a 35.65 all around. Alexia Hinchcliff received a 9.125 for beam and a second place medal. Demetria Scoufos received an 8.825 on floor for a fourth place medal. Zine Hassfurther also captured a fourth place floor medal with an 8.85. The Level 5 Team also won a fourth place team trophy with a score of 104.95. Kayla Tadaki received a 9.325 on vault for second, had a spectacular bar routine receiving a 9.6 and first place on bars, 8.8 on beam, 9.25 on floor for third place and finished with 36.975 all around and a second place trophy. Alecia Uganiza received a 9.275 on vault for second place, 9.05 on bars for fourth place, 9.4 on beam for third place, 9.2 on floor for fourth place and a 36.925 for a third place all around trophy. Kira Spencer captured a fourth place medal with an excellent beam routine scoring 9.175. Samara Clark had a solid 9.0 vault capturing eighth place. Kahina Hewitt had a powerful vault with an 8.675 and seventh place medal. Kaitlyn Sell received a fifth place medal for bar routine scoring 8.675. The Level 4 girls also received a fourth place team trophy with a score of 108.85. Kona Aerials Gymnastics will be starting the Optional season in January competing athletes in Levels 7, 8 & 9. The first meet is the Aloha Gymfest Jan. 13-15 at Le Jardin Academy in Kailua, Oahu and features athletes from Australia, Canada, Japan, Guam, Idaho, Alaska, California, Washington, Texas and seven teams from Hawaii. The second meet is Gymnastics In Paradise Jan. 20-22 in Aiea District Park, Oahu. There will be athletes from Alaska, Idaho, California, Washington, Canada, Pennsylvania, Oregon, Utah, Minnesota, Australia, Japan and Virginia. After that the Kona Aerials Optional team will by flying to Arizona to compete on the mainland. Kona Aerials Optional Team expects to compete in seven meets this season, with a goal of qualifying for Regionals in Portland Oregon in April.